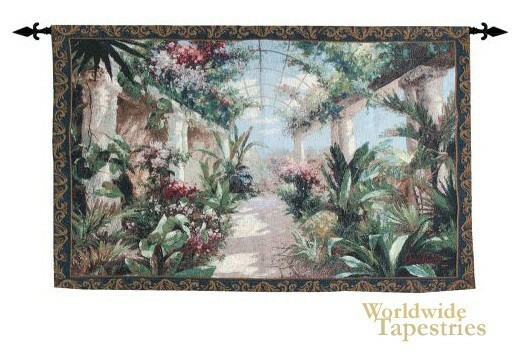 This lovely Garden Charm tapestry shows a garden scene in perspective with sunlight streaming in. Here we see a scene which leads the eye to the distance, in this interior greenhouse and haven for tropical palms and flowers. The outside light comes into this scene through the tall arched glass structure of this greenhouse. Garden Charm tapestry is backed with a lining and has a tunnel for easy hanging. Note: tapestry rod, where pictured, is not included in the price.